I was so excited about the title of this years Celebrate Oz because when I first saw The Wizard of Oz as a child, I was just blown away by the shift from the dull Kansas black and white in the beginning of the film to the riot of Ozian colour when Dorothy awakens in the Land of Oz. Oz was all bright, eye popping color!! And if I think about the colours of Oz now, aside from the Gingham blue and ruby slippers (I wanted to be Dorothy and wear that dress and those slippers), I still see just that: a riot of colour and strange and wonderful faces. Oz is the magical place where the rules of nature are different, animals talk, inanimate things become alive and the whole thing is a glorious riot of colour. 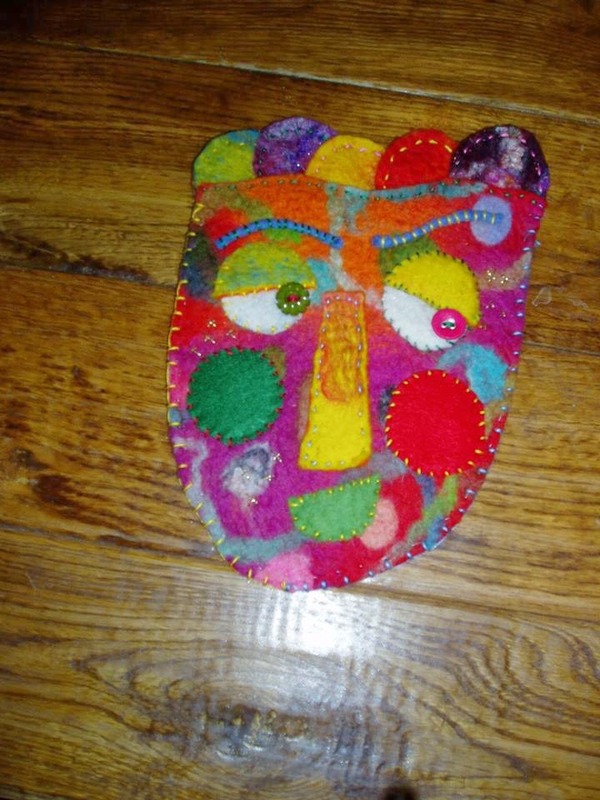 From these childhood memories came my inspiration for the face wall plaque and the cushion. I still have a soft spot for gingham so that runs through both pieces, but the colours and faces are as I saw them as a child. The wall plaque is made from had made wet felt embellished with embroidery details. The Face is sewn onto a backing of unprimed art canvas and then glued to a wooden base, The base was cut with a jigsaw (a newly acquired skill btw) and I decoupaged it to go with the Oz theme. A hook has been added for hanging. 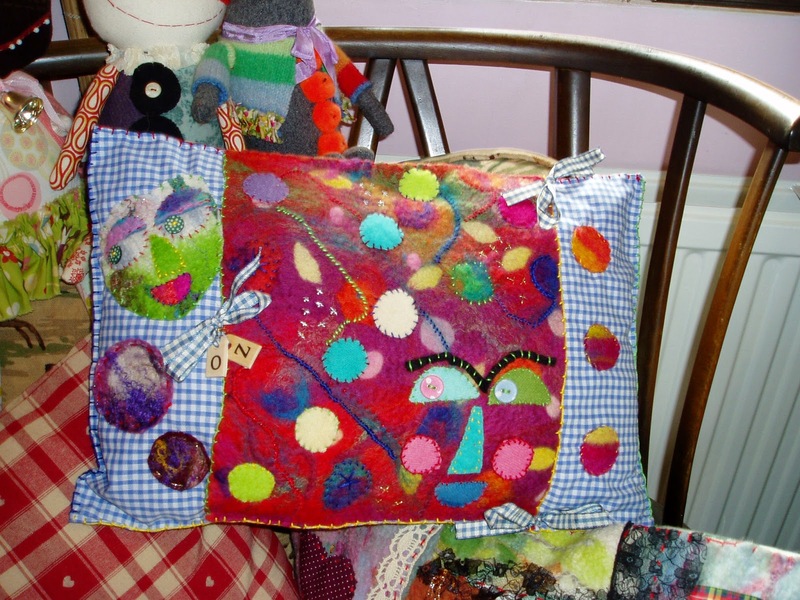 The cushion is hand made from gingham with hand made wet felted panels and embellishments added. Both the wall plaque and the cushion are my giveaways and I would ask that you comment here and let me know which you are interested in. The drawing will be on March 28th and the winner announced here on March 29th. Good luck to all of you. Please take time to go back to Olde Baggs n Stuft Shirts and click on the links to the other partys. Thanks so much for coming here to visit. I, too, was all smiles and happy giggles when I saw that our beloved Oma Linda focused on the Hues of Oz. I was not done reading the post, when I thought: Red! Your post is so very exciting. So many colors and shapes and the sharing of beautiful memories of yesterday. I didn't see Oz until I was an adult. And guess what? I still wanted to wear that dress! Happy Spring and Hues of Oz! Congratulations on your new jigsawing skills. You will have many happy hours together. I love both your creations but that face makes me smile. What magical pieces and oh so Oz!! I remember my first visit to Oz and had the same reaction when the black and white burst into the riot of color. 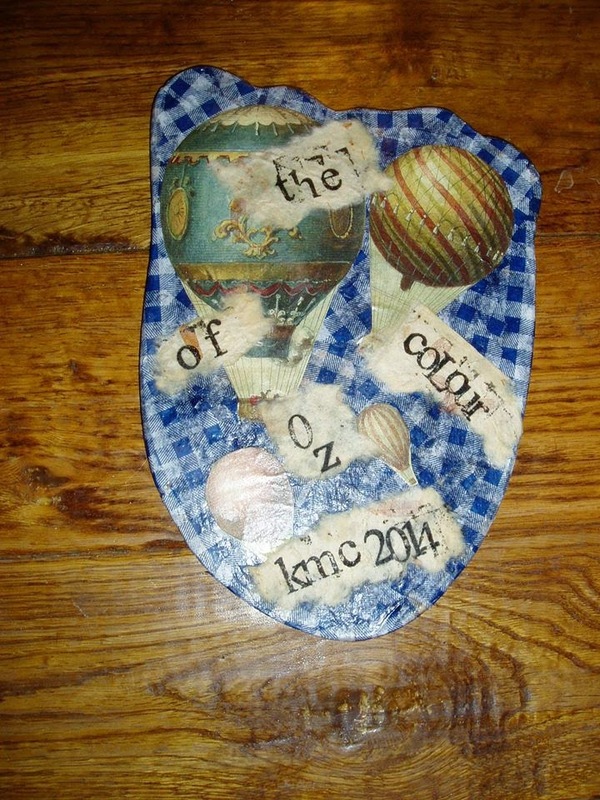 Great entry! Oh I love how you mixed all the colors together. I've never heard of this technique and I find it interesting and lovely. What a wonderful Oz post you have created. What fantastic fiber art! Thank you for your colorful celebration of Oz! What beautiful work you do! I love that wall plaque, it would look fantastic in my studio... just saying LOL. Thank you for such a fun post. Such a wonderful trio of stunning artwork for the Hues of Oz. I love the wall plaque face. It reminds me of Scraps, the Patchwork Girl of Oz. Pales to your colours! Joyful and Fun! Your creations totally capture that 'ooh' moment when Dorothy opens her door and sees all the COLOR! I love them both, but would very much like to have that cushion! Yikes, glad I came to blogger this afternoon...well, ok, almost evening. Hey, put me down for either...you choose. If you pull my name out of the hat, you decide...you know me so well, anyway. Ok, off to your regular one and check out what all you cuckoos are up to. I just BET that if I were to win that Oz Cushion, I could put it on my chair, tap my heels together 3 times, and end up in OZ! When I was young, I wanted to go to OZ so badly but I just didn't know HOW??!! But this Enchanted Magical Pillow would take me there in a flash!! !Who needs Ruby Slippers when you have MAGIC by Kim Cowley? The blue gingham is what really is in the OZ style for your goodies. I am enjoying this Oz blog hop immensely! Thanks so very much for entering me in your sweet giveaway!